What is the difference between a cup and a trophy? This entry was posted on January 25, 2018 by Jessica Anderson. With the New Year comes new resolutions, and for many people that means trying to lose weight. Really the underlying goal is to be healthy, with a balanced lifestyle of eating right and exercising, in order to live longer and feel better! Since a majority of your waking hours are spent at work, your office can be a help or a hindrance to this goal. Holiday treats, donuts, birthdays can all derail your dieting efforts. Instead of an obstacle for reaching your goals, make work a positive, supportive environment for healthy living with friendly competition! Same with friends...happy hour can decimate a diet. Establish an weight loss challenge, either at your office or with your family & friends, to motivate not only you but also those around you to break bad habits, lose weight, and live healthier! How do you set up a challenge? 1. Set up the parameters. Set a point person to be in charge of all metrics, yet who won't share the data or judge. Establish the time frame for how long the competition will last and the weigh-in dates. 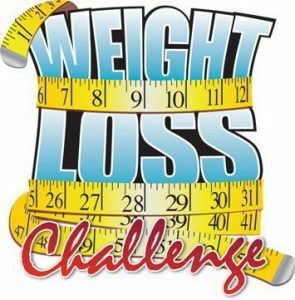 Up the stakes for your weight loss challenge with cash prizes and a Biggest Loser Trophy for the winner! 2. Invite participants. If at the office, advertise around the water cooler, in the gym, at the vending machines. If doing with friends, send an Evite, Facebook group, or Fitbit group to get everyone motivated. 3. Set the rules. Usually you measure by percentage weight lost, number of workouts, etc, not pounds lost. You may also want to include no-nos, like diet pills, laxatives, skipping meals, anything that can sabotage your health. 4. Keep up the Motivation. Create a Pinterest page, Google drive, Facebook group, Snapchat feed or some other shared online location for posting healthy recipes, workout tips, and inspirational messages. Encourage one another to keep going! 5. Reward the winners! Consider a weight loss trophy to your "Biggest Loser", along with prizes along the way during the challenge. If you have members buy into the challenge, then you can award prize money along with your award. 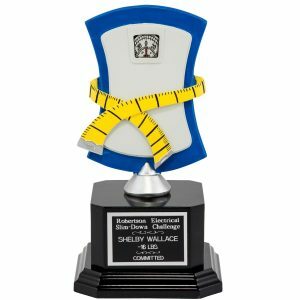 Consider our "Biggest Loser" scale trophy for your winner! Best of luck keeping those resolutions and Happy 2018!